Zurbaran Crucifixion, Art Institute of Chicago. 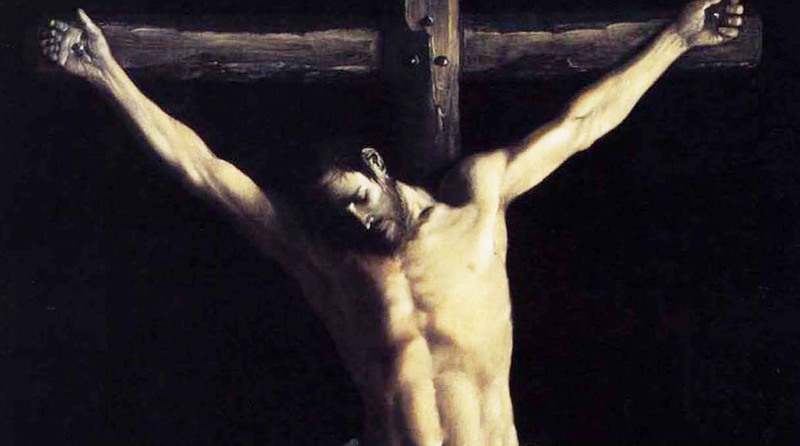 Zurbarán is not the only one who has depicted the Crucifixion isolated by a black background. A few years after Zurbarán, Veláquez painted Christ Crucified, now in the Prado, using a similar technique to isolate the Crucifixion in eternity. For that matter, Dali’s foreshortened Crucifixion, viewed from above (Christ of St. John of the Cross, now in Glasgow) also uses a black background at least behind the Cross. Toward the foot of the Cross, the darkness becomes the sky down to the bay of Port Lligat, where Dali lived. Christ is shown without nails and thorns, and the boat and fisherman at the bottom have clear Christian connotations: the Church is often seen as an ark of salvation, and of course the association of fishermen with the Apostles hardly needs mention. Dali develops this formula in his Crucifixion (Corpus Hypercubus), with its cross as an unfolded tesseract. (I am woeful at maths; this means that the Cross is made as if each face of a cube had a cube projecting from it, resting on a bottom cube.) This time the unwounded Christ is not foreshortened but seen frontally; even so, the blackness towards the top seems to recall these earlier Crucifixions by Zurbarán and Veláquez. Dali was influenced by an antique sketch by St. John of the Cross, hence the painting’s name. Some critics think all this kitsch, but if so, it is memorable kitsch. While I digress with the ease of a seal entering the water, I do have a point. The Zurbarán Crucifix reminds me of the ending of my favorite setting of the Ave Maria I know: the Ave Maria à 4 by Josquin des Prez, sometimes called Ave Maria . . . Virgo Serena. This is a troped, or expanded, version of the “Hail Mary.” While some Protestants find this prayer objectionable, we Catholic and Orthodox Christians know that “praying” to the Saints is not asking them to grant our wishes by themselves. We ask for their prayers to God on our behalf, expanding the Christian custom of asking other Christians for prayers, just as many Baptists do at Wednesday night Prayer Meeting. The difference is these “dead” Christians are alive in the presence of God. None of those in Heaven pray or act apart from God’s will. You may dispute that the dead can hear us; you can argue that they “sleep,” but please do not think those of us who ask the Saints to pray for us are trying a run around God. After all, the Josquin Ave Maria ends “O Mater Dei, memento mei” or “O Mother of God remember me” (that is, “pray for me”).